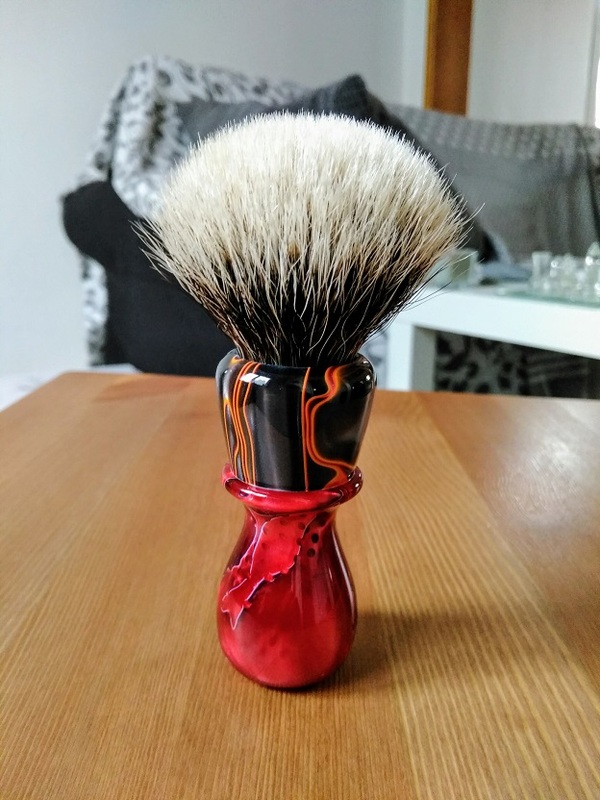 Recently arrived among you, I take the opportunity to present you one of my badgers, my best, realized by a member of a shaving French forum. M. Red is very friendly, approachable and efficient. For my part, I was seduced from the start by his work: resin and wood. 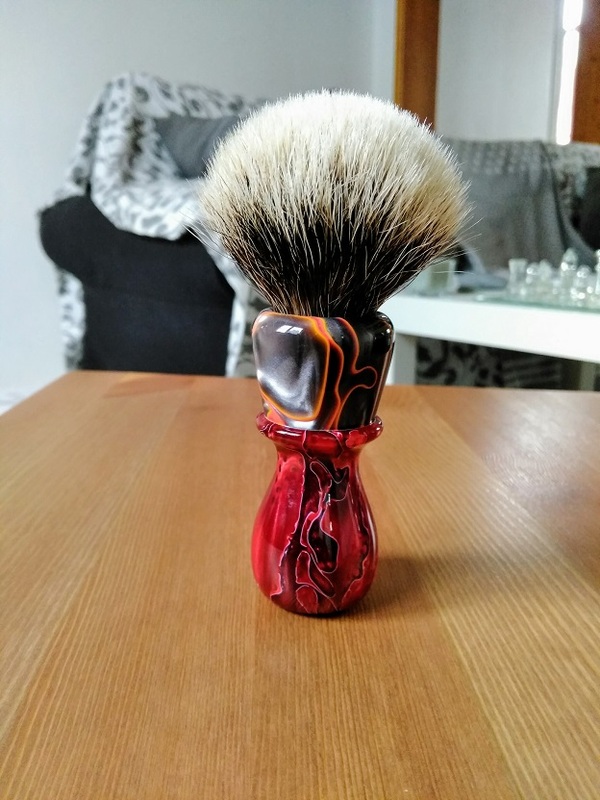 I wanted to show you my badger Mr. Red and get your opinion? Some do not like the combination of these two resins on the French forum, but it was my will and my project. 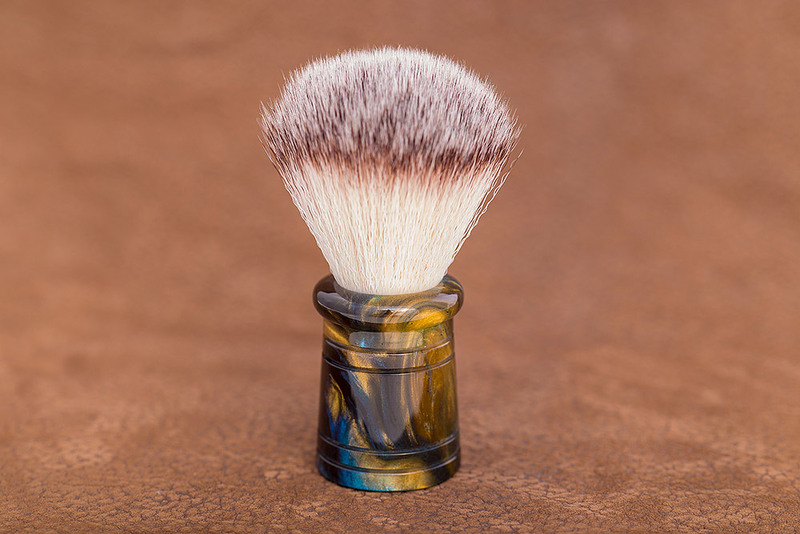 I have had several beautiful custom brushes made and appreciate great looking handles and resins. Beautiful handle and the resin is incredible. Good luck. We agree, the shape of the handle is nice, however, I think back to shorter sleeves in the future, for a matter of weight in particular. I like the shape of the handle and the two band knot. My choice of colour, however, would be faux ivory; but, 26 of my 36 brushes are faux ivory. i have not seen the origin of the knot ? The knot comes from Virginia shaving. But M. Red have a new partner which gives it knots even better ! I already like a lot, but I am looking forward to new orders at home. (01-19-2017, 01:44 PM)Rufus Wrote: I like the shape of the handle and the two band knot. My choice of colour, however, would be faux ivory; but, 26 of my 36 brushes are faux ivory. Bryan, I share your preference for ivory. I do like the shape of this handle. I like it. The colors are unconventional yet it is appealing to me. The handle looks like it is comfortable in the hand. What are the dimensions of the knot? That's a remarkably unique and beautiful creation. (01-19-2017, 04:45 PM)chazt Wrote: I like it. The colors are unconventional yet it is appealing to me. The handle looks like it is comfortable in the hand. What are the dimensions of the knot? Thé knot is 24 mm ans long 48mm !! I love its grip and it makes very good in real ! However, i am trying to sell my badgers at this time, to move on to new projets, i do not like to collect, and it is more difficult than i thought. (01-19-2017, 06:39 PM)Paladin Shaving Wrote: That's a remarkably unique and beautiful creation. Yeah M. Thyllis, M. Red its good craftsmanship and he is very cool !! He is brilliant, surely my best badger, I hope he will like so much to his next owner. Both in terms of its handle grip and the quality of its brush, I find. Nice brushes! 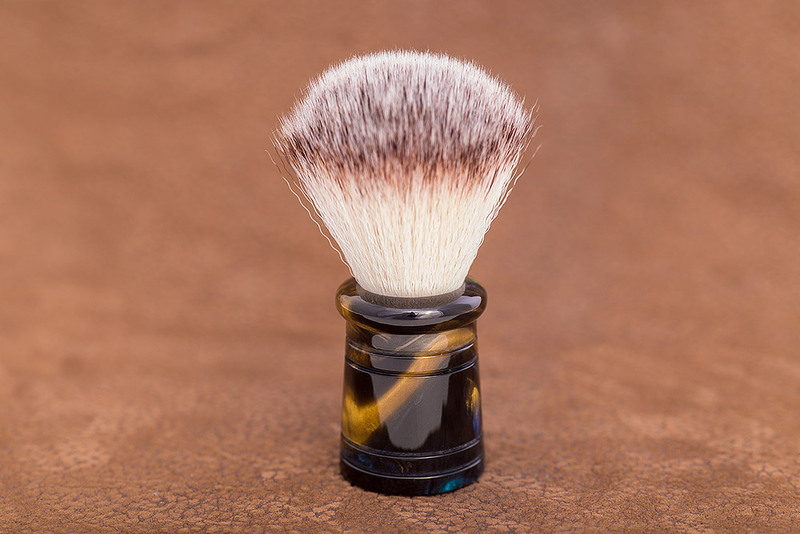 I like the barbershop handles, but maybe just a little shorter than the beautiful brush above! 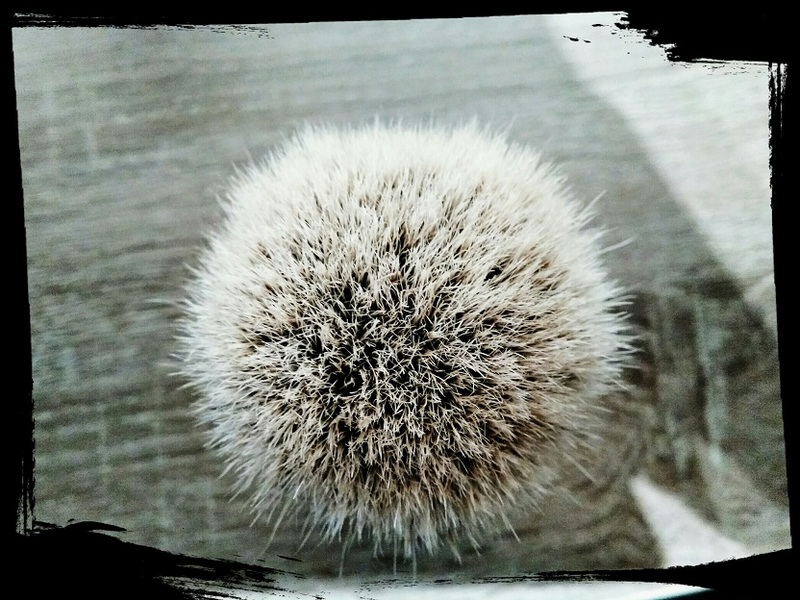 (01-22-2017, 04:50 PM)Steve56 Wrote: Nice brushes! 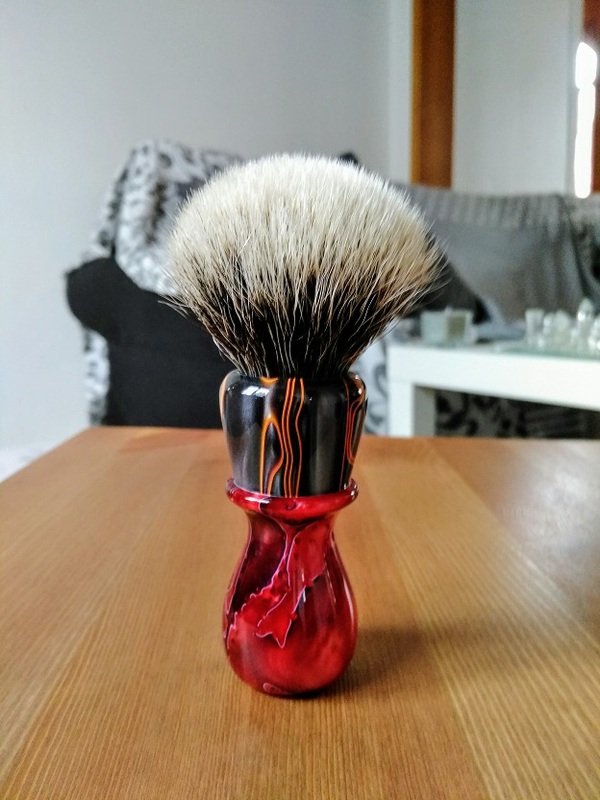 I like the barbershop handles, but maybe just a little shorter than the beautiful brush above! Totally agree with you, in terms of weight, especially, I prefer the handles slightly shorter as is also my El Druida. 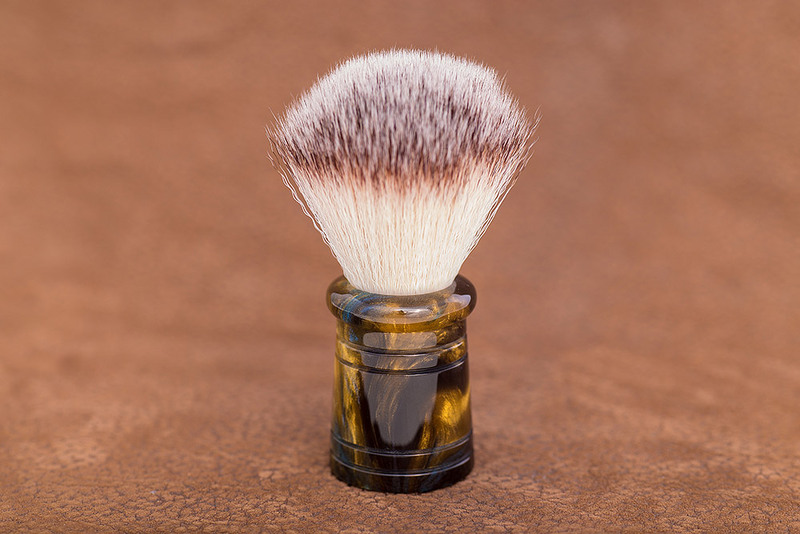 A shorter handle is lighter and therefore inevitably more enjoyable in face lathering.